Through the looking glass: Developing glass sandwiches full of electronics that simply work as expected is an under appreciated feat in today's landscape of advanced technologies. Join us as we take a look at just a small number of tests that Samsung puts their devices through after initial prototypes have been created. Samsung pushes out dozens of new products on a regular basis. Launching so many different electronic devices without running into issues requires extensive testing under all possible conditions that finished products will be exposed to. 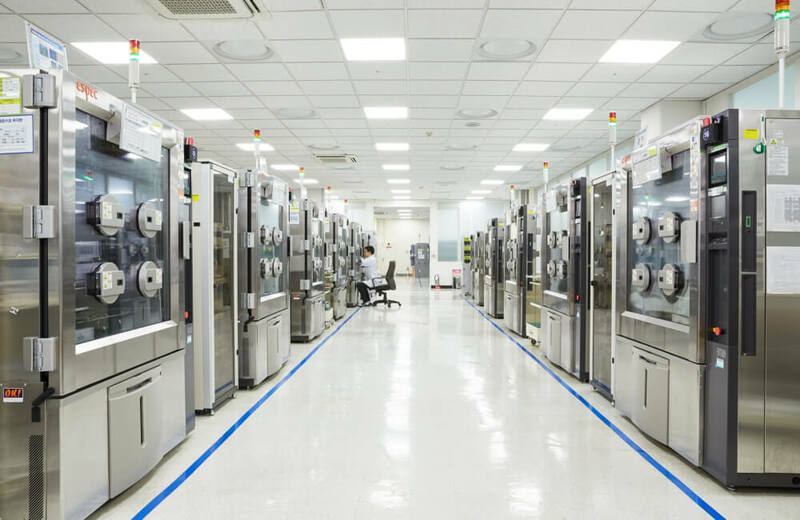 Today, Samsung has shared a look inside of their Reliability Test Group responsible for abusing smartphones and wearables. Cameras have become a highlight feature for smartphone buyers. Everyone wants at least one good camera. Objective testing for exposure, image noise, and color are performed by taking photos using a variety of lighting conditions and test subjects. Following the scientific test methods, a handful of test scenes are thrown at the camera to ensure that the results are pleasing in reality and not just a nice sheet of numbers that theoretically should be good. Aside from having a good camera, call quality and sound are next in the tour. An anechoic chamber is used to isolate outside noises and check how phones perform in different orientations. There are a surprising number of ways that people have found to hold their phones to their faces causing the acoustic performance of microphones and speakers to vary. Adding in accessories such as Bluetooth headsets further complicates the test procedures and analysis of sound. The next two stops along the way can be grouped together as general durability. Drop test stations and automated test fixtures for pushing buttons, opening SIM trays, and simulating the weight of a person repeatedly sitting down on a phone all check for potential long-term quality issues. Cycle testing headphone jacks and USB ports can also be done to ensure ports last the life of the phone. Now that water resistance is a standard feature, Samsung of course has an array of equipment to subject their devices to liquids. Rain tests to full on submersion verify that devices will be able to be certified with ingress protection (IP) ratings. Wearable devices such as the Galaxy Watch, Gear Sport, and Gear Fit 2 Pro go through submersion tests at pressures of up to five atmospheres so as to ensure they remain fully functional while swimming. Lastly, the final stop on the tour is the environmental test lab. Changes in temperature and humidity can affect the operation of sensitive electronics very easily even though most of us are accustomed to having devices that simply work no matter where we take them. Leaving a device out in the sun can significantly degrade batteries, whereas high humidity can cause reduced electrical resistance or even short circuits in extreme cases. After being run through the gamut of tests, all the collected data can be put to use for a revised iteration or put towards a future device. With new devices coming out nearly every week in different areas of the world, Samsung has plenty of products that can benefit from all the data it is constantly generating and storing.